Cinnamon does not only add flavor to different dishes. It can also cure many diseases and is even beneficial for skin health. For centuries, cinnamon has been used in traditional medicines in Asian cultures-Chinese and Indian as a remedy for various skin related diseases and infections. Melanin is a pigment that is responsible for the color of our skin. However, there are times wherein its production goes out of whack thereby making your complexion darker and can even cause sun spots, freckles, or a stubborn tan. If you are experiencing hyperpigmented skin then you should try to use cinnamon oil as it contains eugenol and cinnamaldehyde which help reduce the formation of melanin. Apply cinnamon oil which has been diluted with a carrier oil (coconut oil works particularly well due to its anti-inflammatory and moisturizing properties) in the ratio of 1:20 to fade dark spots or a tan. This common inflammatory skin infection affects almost 30% of Americans. Eczema is a long-lasting disorder characterized by dry, itchy skin which discharges clear liquid when you scratch it. One common traditional remedy amongst South Asian communities is by using a combination of honey and cinnamon powder. According to research, cinnamons’ anti-inflammatory properties make it a useful remedy concerning this skin condition. Some experts advise that the anti-inflammatory properties from cinnamon might also help other inflammatory skin disorders. Cinnamon can help you fight wrinkles, fine lines, and premature aging. It has a compound known as cinnamaldehyde, which has an anti-aging effect on the skin. As we age we lose collagen and this leads to the development of fine lines. Fortunately, cinnamon can facilitate the biosynthesis of collagen, which is a protein that gives your skin structure and strength. You can add cinnamon to your daily cooking or have a cup of warm cinnamon tea. Skin problems like lesions that resemble acne, dryness, swelling, skin reddening, and increased pigmentation can be caused by environmental pollutants such as dioxin. According to studies, the cinnamaldehyde content of cinnamon can prevent the activation of a receptor that binds to environmental pollutants in skin cells as well as exerts a beneficial antioxidant effect. Due to the overproduction of sebum, your skin becomes excessively oily thus playing a significant role in the formation of pimples which can make you feel self-conscious. According to studies cinnamon can inhibit an enzyme known as 5α-reductase which modulates hormones that stimulate sebum production. 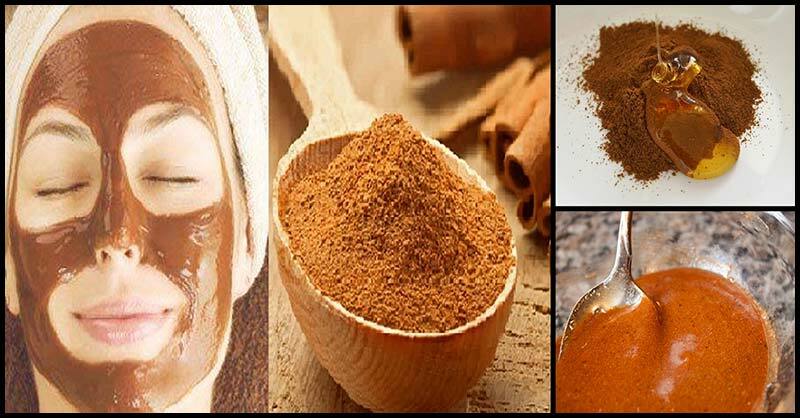 Simply apply a cinnamon face mask if acne is bothering you. Cinnamon contains compounds like cinnamaldehyde and eugenol which are responsible for its antimicrobial properties. Studies have found that cinnamon can effectively act against dermatophytes like Trichophyton rubrum and Trichophyton mentagrophytes which cause fungal skin infections and on candida fungus which causes yeast infections or thrush. To fight skin infection, all you have to do is to wash the affected area with cinnamon-infused water. Do this by simply breaking 8–10 cinnamon sticks and then boil them in about 4 cups of water. Allow the sticks to steep for about 45 minutes and soak affected areas in this water. Do not use more than half to one teaspoon of cinnamon powder at a time. With regards to using cinnamon oil, make sure you do not exceed 2-3 drops of it. Cinnamon oil is should always be mixed with a carrier oil such as coconut oil. The powder also needs to be combined with milder ingredients like honey or milk. In case you feel any discomfort after applying cinnamon powder, paste, or oil, wipe it off the skin with some olive or coconut oil.